Graphite is used throughout the complex processes in the creation and purification of Aluminium. Graphite's has excellent properties of heat and chemical resistant make it an ideal material for Aluminium Extrusion. Graphite molds and casting rings are also used throughout the aluminium industry to fabricate complex aluminium products. Graphite plates and rollers for aluminium extrusion presses. Extruded aluminium is used in the likes of manufacturing modern window frames and shutters. Products include: Graphite Plates of 25 x 25 x 250 mm to 25 x 50 x 500 mm, Rollers of Dia 70 and 75 mm etc. Casting rings for hot top casting or for gas slip system. Graphite shafts and graphite impellers are used in rotary purification systems for aluminium degassing. the heat extraction necessary to transform the metal from liquid to solid state. The continuous casting of non-ferrous and precious metals represent a widely used manufacturing method. This method offers the advantage of non-stop production and ensures optimum material quality as a result of rapid solidification. Two highly useful characteristics are the uniformity of product structure and absence of shrink-holes. As the resulting cast metal surfaces are generally smooth and unblemished, extensive finishing is not usually needed. An important component of the continuous casting machine is the cooling device, which consists of a water-cooled jacket and a mold (die). 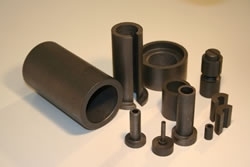 Graphite combines a number of favorable properties and is therefore preferably used as a mold (die) material. Graphite Dies for Continuous Casting - For Drawing Copper and Brass Wire/Rods of 12mm, 16mm and 20mm etc (8mm to 40mm).